It's fair to say I've done a heck of a lot of teeth-grinding over princess books in my time. Butterflies and fairies have come close, but have nothing on the torment I've been through over the whole princess debacle. Yes, I love Disney princess films, but only for their divine, retro illustration and tender quasi-alignment with true fairytales. I will admit, however, that I've also grown fond of their sweetly delusional plots over the years, as they've proved fabulous educational fodder for my children, who are fully versed in the stereotypical princess illusion delusion. Put it this way--my husband occasionally calls my daughter 'princess' but it's only ever in the 'why yes, I CAN ferry you to 900 events this weekend, your majesty' kind of way. So--princess books aren't something I find myself tripping over. 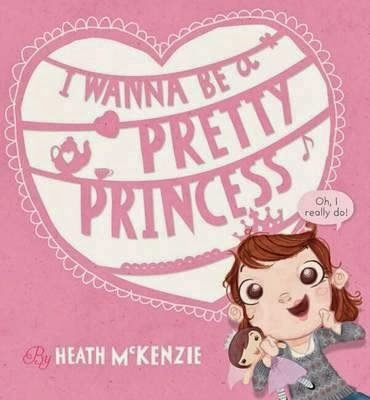 Take one look at Heath McKenzie's latest book, however--noting the face on that girl and the tongue-in-cheek title--and you may just think it was written by a dad who calls his girl princess in the manner described above. I absolutely LOVE this book. I love its clean-as-a-whistle Disney illustrations, I love its styling, its language, its dry humour, its honesty, its powerful punch of an ending that has nothing to do with feminism and everything to do with personal empowerment. McKenzie's iconic illustrations are a beautiful dance between classically gorgeous and outright funny. Kids will be entranced by the vibrant emotion on our heroine's face as she goes about the glorious task of self-discovery. It's SO hard to tell you more about the storyline because it really does need to be read 'clean' with no spoilers--not even a hint. My advice would be to just hunt it out, pronto, especially if you have a daughter, but also if you have a son. Officially my favourite Heath McKenzie book EVER.